I am going to talk about a text editor and a couple of strange beasts today. 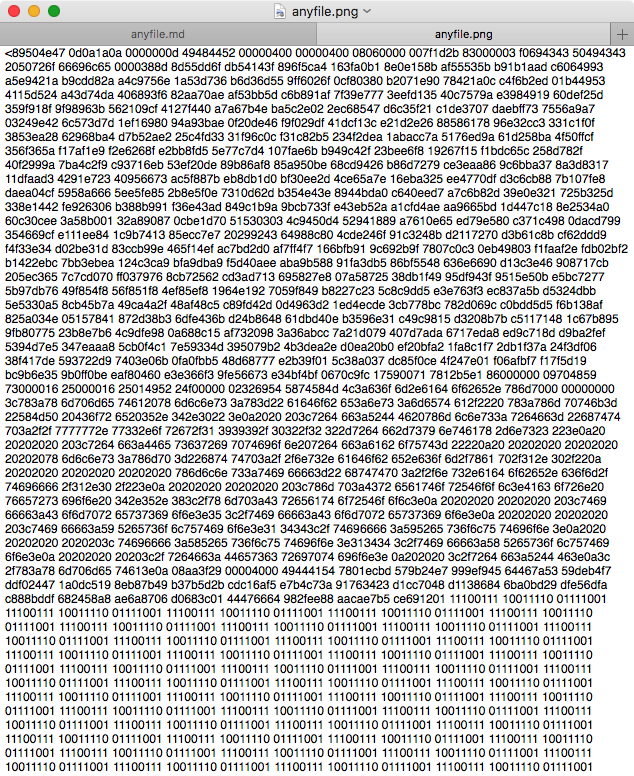 This is Anyfile. It is a fast simple text editor. It lets you open, edit and save text files. Doesn't do much of anything else. It is a window where you can deal with text files in a quick way. AnyFile is devoid of preferences. It is an editing window where you can write. You have no opportunity to customize anything. Anyfile's claim to fame is that it opens every file. It opens every text file, irrespective of the extension. Doesn't give you syntax highlighting or anything fancy like that, but it opens it. Opens the file quickly. If you open an image file in it, it gives you a binary representation of the data of the image file. If you are a developer, this might be of interest to you, but for me, I have no idea what to do with the data. If the binary data floats your boat, have at it. Anyfile is fast. It is barebones by design. It is well-designed in that it makes conscious choices of the features it wants to support and those it doesn't care for. It does support automatic saving of your documents and builds in support for the macOS versions function. It doesn't have a print function. It supports the macOS tabs bar. So you can have multiple documents open in it. In a crowded field of text editors, Anyfile brings too little to the table. If you are looking for a cheap text editor, there is a plethora of choices nowadays. Both BBEdit, and CotEditor are much better options. They both do a lot more than Anyfile. BBEdit has a free tier and CotEditor is free. Klipped Is the "Back of Your Hand"
Klipped is strange beast number one. Conceptualized by the developer as "the back of your hand." It is an editable clipboard. One window. You write or copy stuff into it. You take the stuff you have in it and copy and paste into something else. Klipped can lurk around being the repository of random snippets of text. Just text. No save function. No export function. No preferences. Just a window where you can type some stuff in. Surprisingly, it supports the print function. There is a background mode where the user interface changes to a menubar application. The program in this state grows two settings: A lights off mode (a dark option), and whether you want to be in windowed mode or not. I prefer windowed mode. In background mode (the opposite of windowed mode), Klipped disappears from the task switcher which means that I need a mouse/trackpad to get to the editing window. I am not fond of moving my hand away from the keyboard. Klipped is the back of your hand in the digital sense, or a scratchpad to record your musings. It is just one window. It is an effective metaphor for a place to scribble on. If this sounds interesting, you should download the application and try it out. You might also want to check out FromScratch, a Place to Doodle With Words. Update: Klipped now costs $0.99. Origin is strange beast number two. Teachers of fiction-writing sometimes tell aspiring novelists to just write the first draft. Don't edit. Just write. Editing is for later. Origin makes that possible. The Ultimate writing tool to go from an idea to the first draft. A simple, minimalistic, distraction-free, typewriter styled writing tool, that lets you just write and save plain-text files. Origin is defined by one unique feature and the absence of a whole host of other features. The one feature which distinguishes Origin is the mode of entering text. The cursor in Origin is at the center of the input window. It doesn't move. The paper behind it moves with the words you type on it. It is a simulation of the typewriter paper scrolling at the back while the keys hit the paper. It is an interesting and somewhat hypnotic effect on the computer screen, specially in full screen mode. The features which are absent are the other distinguishing characteristics of Origin. You can't delete anything which you have written previously unless the stuff you want to delete is right around the cursor of your present edit. In fact the only way to delete is to delete everything from the cursor to the content you want to delete. There is no scroll. No undo/redo. No cut, copy or paste. There is no formatting, no tweaking of the already written text and there is no printing. There is also a Strict Mode where you can't edit anything or go back at all. In Strict Mode you lose the delete key. Rather harsh but effective. This is a writing environment where you type. Just type. Tell your story. Editing is for later. Reminded me of a scene from a movie called Finding Forrester. I am going to be using Origin to work on the first draft of a novel which has been brewing in my mind. Will let you know how it turns out. In the meantime, Origin is a unique writing environment which forces you to type out the first draft of the idea you have in mind. It is well designed software for a very specific need. If you have that need this is a very decent solution. Origin is recommended heartily for delivering on its promise. Klipped was free. I got AnyFile when it was on sale for free, and I paid for the in-app purchase of Origin.